‘Kahili Ginger’ or the ‘Giant Butterfly Ginger Lily’. Most cold hardy of the Ginger lilies, and easily cultivated. 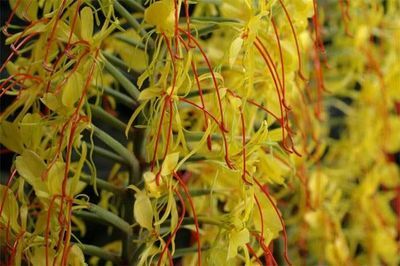 The yellow flowers with attractive red filaments are delightfully perfumed and borne on spikes 30-45 cm. high. Canes are 1-1.5m. high with long leaves that are powdery white beneath when young.